i love it when presidents come to town – as long as i don’t have to travel anywhere, of course. the city closes off all the streets, moves all the trash cans from every corner, stations 6 cops on every single corner and set up blockades all along the route – the pomp & circumstance is fabulous. first the test cars come through – usually a couple of black escalades, then a few nypd cars, a couple of motorcycle cops and maybe even some kind of completely non-descript taurus or something. that’s when you know he’ll be arriving within 20 minutes or so. motorcycle cops lead the motorcade. lots of them – followed by a slew of escalades with security men peering out of every window, then the presidential limos – 2 of them. apparently that’s to fool possible assassins – seems a bit silly to me but luckily i’m not in charge. after a bunch more escalades, cop cars, ambulances and some more cops on motorcycles – and then it’s over. obama was escorted all the way to daniels for dinner. here he is driving right past my apartment last night. obama did wave to the crowd which left me wondering about the 2 limo fool -the- people strategy. i hope he ordered the crab cakes. 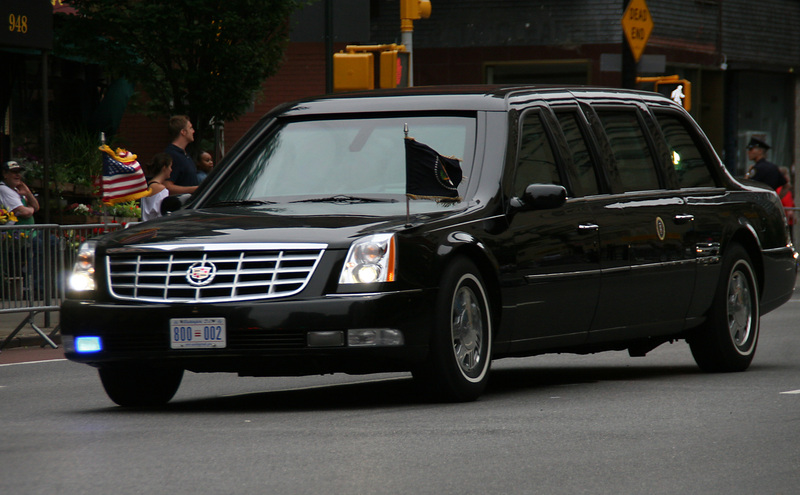 This entry was posted in humor and tagged daniel boulud's, obama nyc, presidential limo. Bookmark the permalink.